Although not unfamiliar with Richelle Mead I had not previously read the Vampire Academy novels. Despite this I did not feel I was missing out by reading an abridged graphic novel which can never have the level of detail of a full novel. The story flowed coherently with sufficient time devoted to character interaction and development. Have to admit that now I have read this I am tempted to pick up the novel as a point of comparison and then continue on through the rest of the range. As a graphic novel this title is also a success. The artwork (both drawing and colouring) is of a very high standard. It has a lot of text rather than favouring the style of some comic books whereby there is a great deal of flashy fight scenes and little dialogue. 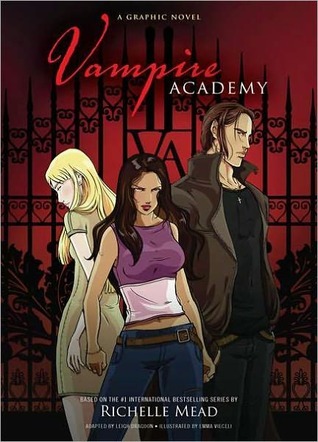 To summarise this graphic novel certainly served as an excellent introduction to the Vampire Academy setting. It would also be suited to general comic book lovers. I do love these graphic novels. Just picked up the Twilight ones last night and they are fabulous. This was the first graphic novel I'd read & I loved the illustrations :o) Still think I prefer a full length novel though as you get so much more depth to the story. Viv, I picked up the 2nd volume of the Twilight novel last night too - I may possibly have ordered the first one from Amazon when I got home lol. So much for my buying ban! I haven't yet read a graphic novel but I'm now thinking this might be a good one to pick up.